Now remember, I goofed and cut 12 pieces. You should only have nine. You are going to pick up two different pieces and lay them right sides together so that they line up nicely. Take your straight pins and pin down one of the long edges so they are nice and snug for sewing. See how the underside of the fabric is up? That way the seams will be on the inside when you sew them together. Lining up the edge of your fabric with the right edge of you sewing machine foot, stitch a straight line down the pinned edge. If you have placed your pins like mine in the photo, your needle should roll off of them while sewing. If you have placed them parallel with the edge of the fabric then you'd better watch out as you are about to break your needle! If you have the privilege of owning a serger, then move your pins away from the edge and run the side of you garment through the serger for a satisfying and clean seam. Once you have sewn the first to pieces together, pick up your third piece and place it right sides together with one of the two pieces sewn together. Pin it and sew down the edge. Repeat with the remaining six pieces, continuing the same fabric pattern that the first three pieces follow. When you are finished you should have a long piece of fabric. Do not sew the last two edges together to make a circle. We have a couple more steps to complete before we are at the step. Yeah! 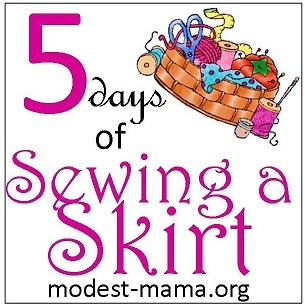 You've completed Day 3 of Sewing a Skirt!